1-Methoxy-2-propanol base. Fast drying. Average grain size less than 1 µm and Silver content is 60%. Sheet resistance is 0.02 ohm per square inch @ 1 mil thickness. Comes with a brush attached to the cap. Service temperature is 30 minutes at 200°C. A silver-based shielding coating which provides electromagnetic compatibility (EMC) and has been specifically designed to give increased coverage while maintaining a very high conductivity. It is a very economic means of achieving excellent shielding against radiated electromagnetic interference (EMI). It maintains its low resistance even after exposure to heat, cold, humidity and salt spray. It is an air drying system that requires no primer or top coat. It is easily applied by spray or included brush and is compatible with plastics commonly used for electronic equipment enclosures. Electrodag 1415M is designed to replace all discontinued shielding coatings that had contained silver-plated copper. Flat surface texture. The average flake size is 1µm. Service temperature: 306°C. Flat surface texture. The average flake size is 1µm. Service temperature is 204°C. 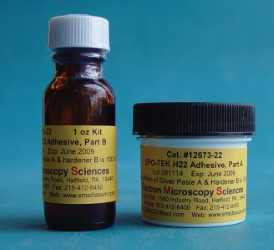 This electrically conductive silver epoxy is used for adhering samples as well as solderless connections such as bonding in electric design, prototype and repair work, circuit board repair, surface mount connections, static discharge, shielding and grounding. 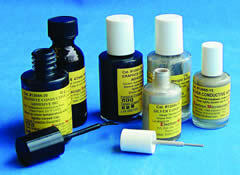 It is also ideal for the bonding of heat sensitive components. Its curing time is within ten minutes at 100°F (38°C), or at room temperature. Conductivity is 0.001 ohm/cm. This pen is designed for making instant conductive silver traces. It is ideal for applying samples to SEM stubs. A unique valve tip allows for very smooth flow withnormal writing pressure and it is spring loaded to prevent clogging. For conductivity traces, solderable termination's are possible using a 250°F cure for 15-20 minutes. Tin, lead, or silver solder can be used (Do not exceed 350°F for more than 5 seconds). Each pen is filled with approximately 100 feet of traces. Silver content: 39-45% with less than 10 micron diameter.The thinner that is used for this pen is Butyl Acetate. Permanently mark on nearly any surface in white color and the marking is waterproof. This pen is ideal for SEM, marking sample identification on carbon tabs, aluminum stubs, conductive tape or any similar surface. The pen contains xylene. Replaced by Silver Conductive Adhesive 503. This EMS one part Epoxy Gold Paste is a gold-filled conductive bonding, exhibiting high electrical conductivity and bond strength. 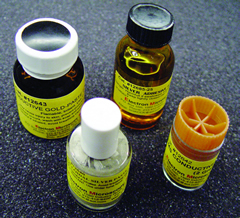 This Gold Paste is used in preference to silver-epoxy or other silver preparations to avoid silver migration problems, or when a higher signal is required. Shelf life for this product is one year under original seal. Store in cool place. An easy to use graphite spray to coat small samples. It is fast drying and produces a very flat, thin, and uniform graphite film. Its service temperature is up to 204°C. It's electrical resistance is 1.2 kohm/sq" at 1 ml thickness. EPO-TEK® H20E is a two component, 100% solids silver-filled epoxy system for chip/electronic bonding in microelectronic and optoelectronic as well as SEM mounting applications. Used extensively for themal management applications due to its high thermal conductivity.